Dr. De earned her degree from Texas A&M University. She also has a BA in psychology from the University of Texas at Austin. Dr. De has been a veterinarian for over 10 years and brings her experience both with emergency care and general practice to Seattle Veterinary Associates. She has a special interest in internal medicine and soft tissue surgery. 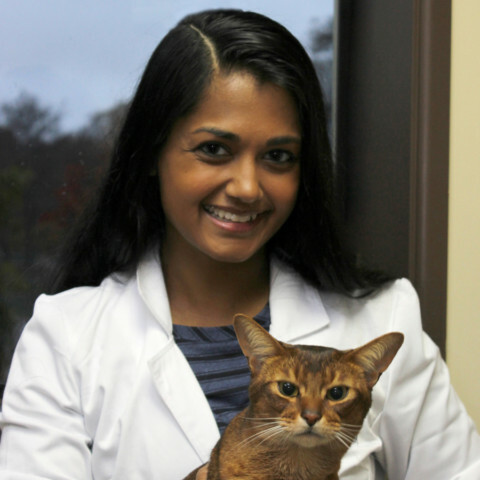 She says one of the most satisfying parts of her job is working with fractious cats and finding ways to provide medical care while keeping them calm and minimizing their stress. Dr. De recently moved to Seattle from New Hampshire with her beautiful Tortoiseshell cat Sass and has a long-distance relationship with a spoiled mix-breed dog named Soup. She loves to hike and snow board which makes Seattle a perfect fit for her lifestyle. As she settles into her new home she looks forward to exploring the city and meeting lots of new people.